This paper outlines the research being undertaken by the recently-initiated four-year (to March 2022) project on the small stream network in Ireland (SSNet) funded by the Irish Environmental Protection Agency (EPA). The overarching objective of SSNet is to advance knowledge on the role of small streams in water quality, biodiversity and ecosystem services protection that will inform policy, measures and management options to meet water quality and other resources protection targets. The project will start with a synthesis of available information on the importance of small streams to initiate communication with stakeholders and introduce the project. This will be followed by a compilation and analysis of existing data on small streams in Ireland to inform the selection of sites for the proposed research. Three work packages will collect new data on hydrochemistry with a focus on the nutrient retention potential of headwater streams, hydromorphology and biodiversity. All three investigations will share common sites to enable interconnections between the three elements to be explored and provide an integrated approach to the research. Modelling based on the results from each of the aforementioned tasks will be used to estimate the level of intervention in the small stream network required to have measurable effects throughout a catchment on both water quality (N, P & sediment) and flows, and overall delivery/maintenance of ecosystem services. We will also engage volunteers in both biological water quality and hydromorphological assessments and evaluate the potential of citizen science in facilitating greater monitoring coverage of the small stream network. This paper introduces the research being undertaken by the recently-initiated four-year (to March 2022) project on the small stream network in Ireland (SSNet) funded by the Irish Environmental Protection Agency (EPA). This is among the most recent body of research addressing the need to focus attention on the role of the small stream network in tackling river water quality issues and declining aquatic biodiversity. The overarching objective of SSNet is to advance knowledge on the role of small streams in water quality, biodiversity and ecosystem services protection to inform policy, measures and management options to meet the European Water Framework Directive (WFD) objectives and other resource protection targets. In their seminal paper Lowe and Likens (2005) emphasised that efforts to protect and enhance the long-term ecological health and ecosystem services of freshwater systems cannot proceed without intact and functional headwaters (where most small streams are located), a point reiterated by Callanan et al. (2012) and Callanan et al. (2014) . Recent initiatives and publications have drawn further attention to the need to focus research and management attention on the small water bodies, in particular the small stream network, to address catchment water quality and biodiversity concerns as well as the sustainable management of ecosystem services. These concerns were the impetus for dedicated publications on ‘small water bodies’ at national (Ireland) ( Kelly-Quinn and Baars 2014 and international levels ( Kelly-Quinn et al. 2017 Biggs et al. 2016 ). Workshops with practitioners have also been held in Ireland ( IBIS 2012 ), UK ( Anonymous 2014 ) and at the European level in 2013 ( Biggs et al. 2014 ). The latter workshop on ‘The Protection and Management of Small Water Bodies‘, hosted by the European Environmental Bureau, in cooperation with the European Commission, the Lithuanian Presidency of the EU and the Freshwater Habitats Trust, was attended by representatives of 60 organisations across Europe ( Biggs et al. 2014 ). Among the key conclusions of the workshop was that small water bodies should be better integrated into efforts to implement and achieve the objectives of the Water Framework Directive and other, nature-related directives. Knowledge gaps (in addition to resource issues) were highlighted as one of the impediments to enabling this integration. Since then, a ‘Small Water Body Expert Group’ was established in the UK in 2014 (http://catchmentbasedapproach.org/discussions/383-expert-group-on-small-water-bodies) involving participants, including Irish representation, from a wide range of disciplines (hydrology, ecology, fisheries, hydrochemistry, etc.) from both academia and management agencies. Also highlighting the need to focus attention on small streams have been the review papers written by Meyer and Wallace (2001) , Meyer et al. (2007a), Meyer et al. (2007b) and more recently by Wohl (2017) and Riley et al. (2018) , and a recent evaluation of the nutrient water quality status and eutrophication of headwater streams within the wider river network in Great Britain ( Jarvie et al. 2018b ). In this review we highlight key knowledge gaps that need to be addressed and that have helped define the research tasks of the recently initiated SSNet project on the small stream network in Ireland. There is no universally accepted definition of what constitutes a small stream and the term is often used interchangeably with headwater. While most, but not all, small streams lie in headwater reaches, they also include small lowland and short coastal streams ( Moore and Richardson 2003 , Ovenden and Gregory 1980 ). Small streams including headwaters have been defined on the basis of Strahler stream order ( Fig. 1 ) (generally 1st and 2nd order, e.g. Meyer et al. 2007b , Clarke et al. 2008 , Barmuta et al. 2009 ), or distance from source (up 2.5 km, e.g. Furse 2000 ), or catchment area (1-10 km2, e.g. Gomi et al. 2002 , MacDonald and Coe 2007 ) and stream width ( IBIS 2012 , Downing et al. 2012 ). Some classifications are on the basis of flow duration into perennial, intermittent and ephemeral streams, with the latter two most often referred to as temporary streams. Regardless of the definition, small streams constitute a large proportion of the river network; global figures are as high as 80% ( Downing et al. 2012 ) and a similar overall figure has been given for Europe ( Kristensen and Globevnik 2014 ). In Ireland, 75% of the river network is either first (51.01%) or second (24.13%) order streams (based on Environmental Portection Agency Ireland river network map). The importance of, and ecosystem services provided by, small streams are well documented in the aforementioned reviews and other literature. These streams act as the ‘capillaries’ of the landscape capturing and moving water, for example 70% to 90% of a river’s flow is estimated to come through the headwaters (e.g. Alexander et al. 2007 ). They play a critically important role in flow regulation both through water storage/groundwater recharge and through flood amelioration, although there is a paucity of quantitative estimates. Retention and cycling of nutrients in small streams provide an important ecosystem service by transforming and regulating the downstream delivery of nutrients ( Withers and Jarvie 2008 ). According to these authors some streams can be ‘hotspots’ of organic matter and nutrient processing. Their contribution is often disproportionate to their size and can significantly influence downstream water quality and ecological integrity ( Gomi et al. 2002 , Alexander et al. 2007 , Dodds and Oakes 2008 ). Here, again, quantitative data are scarce for Ireland. Overall, small streams have the potential to positively or negatively influence water quality and quantity further downstream. The challenge is to identify the factors which determine that capacity. In terms of biodiversity, Meyer et al. (2007a) categorised the biodiversity of headwater streams into species that are unique to this part of the river network, species that occur there but also in larger rivers, species that move into headwaters seasonally and those that migrate there to complete particular life history stages (e.g. salmonids for spawning). They also proposed including species that live near these streams in semi-aquatic or riparian habitats. While any one stream may support few species it is the combined total from the network that makes it important and this emphasises the need to consider the biodiversity potential of each headwater branch, and ultimately the protection of key branches that make a significant contribution to either regional or catchment biodiversity, provide habitat for rare or protected species (e.g. pearl mussel) and contribute to the ecological integrity of the entire river network ( Furse 2000, Heino 2005 , Clarke et al. 2008, Finn et al. 2011 ). In Ireland as much as 29% of a catchment’s macroinvertebrate biodiversity can be unique to headwaters ( Feeley and Kelly-Quinn 2012 , Callanan et al. 2014 ). The classification of headwater streams, based only on macroinvertebrates ( Callanan et al. 2012 ), and ongoing work by the Teagasc Agricultural Catchments Programme are among the few focused studies on small streams in Ireland. Apart from limited data from the RIVTYPE ( Kelly-Quinn et al. 2005 ) and HYDROFOR (low conductivity streams Kelly-Quinn et al. 2016 ) projects, and what is held by the Irish EPA the phytobenthos assemblages of small streams has not been adequately described but is recognised for its important contributions in terms of nutrient assimilation and oxygen budgets. Similarly, apart from Weekes et al. (2014) there are few studies on the macrophytes of small streams. Other sources of information on small streams in Ireland are more disparate and are part of studies with varying objectives. Overall, we have a very patchy knowledge of the biodiversity of small streams. While it is generally hypothesised that the physical habitat and hydrological diversity contributes to the ecological autonomy of the network branches ( Lowe and Likens 2005 ) and thus their biodiversity importance, few studies have demonstrated the role of these factors at network scale. Friberg et al. (2016) and Kupilas et al. (2015) have looked at reach-scale responses. Here again, this is a knowledge gap (i.e. the link between hydromorphology and ecological components) that needs to be addressed in Ireland and elsewhere. With the exception of short coastal streams the role of headwaters in supporting fish populations is well known, particularly in relation to salmonids. However, small coastal streams in Ireland, and elsewhere in Europe, have received little, if any, attention to date ( Whelan 2014 ). These small streams, isolated from larger inland waterways, are common along the entire seaboard of Ireland. By their very nature such streams are transitory and subject to wide natural fluctuations in river levels ( Whelan 2014 ). Furthermore, they can be adversely impacted by both drought and by periods of high flow during storm conditions ( Whelan 2014 ). Nevertheless, these streams, ranging from several hundred meters to several kilometers in length, and generally no larger than 1st or 2nd order systems, likely provide habitat for salmonids and are potentially a major player in the recruitment and sustainability of coastal sea trout populations ( McCully and Whelan 2013 ) but this remains to be investigated. The many contributions of the small stream network are vulnerable to anthropogenic inputs, channel modifications and other disturbances due to their high connectivity with adjacent land, large contributing catchment relative to their size, low dilution capacity, and in many cases short water residence times, particularly where land has been drained (e.g. Snell et al. 2014 ). Diffuse inputs of nutrients and organic matter from agricultural and forestry activities (e.g. Mellander et al. 2015, Clarke et al. 2015 ), and discharges from septic tanks and other point sources can lead to local water quality deterioration and can also compromise the capacity of headwater streams to assimilate and store nutrients and organic matter with resulting higher export to downstream reaches ( Alexander et al. 2007 ). For example, anoxia in streambed sediments can increase phosphorus remobilisation ( Palmer-Felgate et al. 2010 ). Pesticides are likely to be a problem in some agricultural catchments although little data are available for small streams ( McKnight et al. 2015 ). Physical habitat or hydromorphological alterations due to drainage and channel modification pose problems at local and catchment level ( Bradley et al. 2015 ). This not only affects habitat heterogeneity and the biodiversity potential but, through increased flow rates, also reduces water and sediment residence times, which can increase downstream delivery of nutrients and other contaminants ( Alexander et al. 2007 ). High flows can result in increased stream-bank erosion and delivery of sediments from soil disturbance associated with agriculture and forestry. Furthermore, Ireland has an extensive road network with numerous culverts on small streams (unpublished data collected by the Reconnect project - www.ucd.ie/reconnect) which can lead to inputs of heavy metal and other contaminants ( Maltby et al. 1995 ). Monitoring of the condition (hydromorphology, biodiversity and/or water quality) of the small stream network is challenging due to its extensive length (63731 km in Ireland). Apart from the small number of 1st and 2nd order sites in the EPA monitoring programme and sites covered by the Small Streams Risk Score (SSRS) assessments (usually targeting problem areas) there is inadequate knowledge of the condition of the small stream network. Options to increase monitoring in the small stream network need to be explored. Key options include the use of eDNA and citizen science. eDNA has the potential to become a standard bioassessment tool and there is significant effort at the European level to integrate such DNA tools into routine monitoring (see Cost Action CA15219 - DNAqua-Net (http://dnaqua.net) & Leese et al. 2016 ). Citizen science is becoming increasingly important in environmental research (e.g. Silvertown 2009 ) including on river environments (e.g. DiFiore and Fitch 2016 , Shuker et al. 2017 ). Both options are investigated in this proposal. 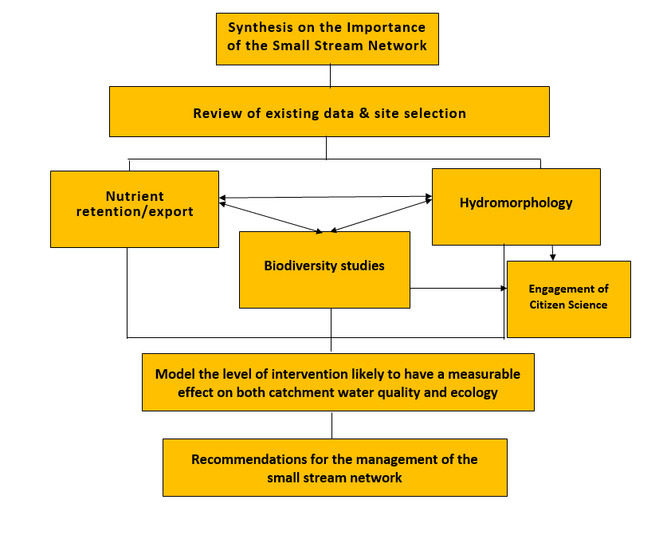 Research being undertaken by SSNet will address these highlighted knowledge gaps, and provide a science-informed knowledge base for the management of the small stream network for improved local and downstream water quality, and protection of biodiversity and ecosystem services. The proposed study will provide specific policy recommendations and targeted management interventions to improve water quality, security of water supply, protection of biodiversity, recognition of ecosystem services from small streams and achievement of sustainable use of freshwater resources. The results will help address specific legislation targets, in particular the WFD which is the key EU legislation requiring member states to improve and sustainably manage water quality, with an emphasis on maintenance/restoration of good ecological status. A number of other policy documents emphasise the need to address water quality and quantity issues, and consider ecosystem service and biodiversity protection. Food Harvest 2020 highlights the importance of water quality protection and improvement for sustainable food production. Also of relevance here are the Floods Directive and Nitrate Regulations, as an integrated approach to all legislative requirements is sought. The European Commission communication ‘A Blueprint to Safeguard Europe's Water’ ( EC 2012 ) strives to halt increasing deterioration in water quality, associated loss of biodiversity and degradation of ecosystem services in the EU by 2020. The blueprint also recognises the complexity of interacting stressors on freshwater ecosystems and that stakeholder involvement is needed to achieve improvement. The EU Biodiversity Strategy, adopted April 2012, requires member states to halt the loss of biodiversity and the degradation of ecosystem services in the EU by 2020, and restore them in so far as is feasible, while stepping up the EU contribution to averting global biodiversity loss. It states that ‘By 2050, European Union biodiversity and the ecosystem services it provides – its natural capital – are protected, valued and appropriately restored for biodiversity's intrinsic value and essential contribution to human wellbeing and economic prosperity, and so that catastrophic changes caused by the loss of biodiversity are avoided’. The EU's 2050 vision as set out in the 7th Environment Action Programme ( EU 2013 ) is for a society 'living well within the limits of the planet'. Its message is that ‘prosperity and healthy environment stem from an innovative, circular economy where nothing is wasted and where natural resources are managed sustainably, and biodiversity is protected, valued and restored in ways that enhance our society’s resilience’. This also links closely with the 2030 Agenda for Sustainable Development and its 17 Sustainable Development Goals, in particular SDG6 and its sub tasks 6.3 (improve water quality) and 6.6 (protect and restore water-related ecosystem), which are relevant in terms of biodiversity and water-derived ecosystem services protection. These targets require improved, scientifically robust knowledge of all components of river catchments and adequate consideration of the importance of the small stream network to enable adoption of measures that protect and capitalise on its potential to protect local and downstream water quality, regional and catchment biodiversity as well as the ecosystem processes underpinning the delivery of ecosystem services. It is also recognised that greater public engagement is needed if we are to effectively address environmental problems including loss of biodiversity ( Wall et al. 2016 ). One element of the research will engage citizen science in monitoring of both ecological and hydromorphological water quality. The project aims will be achieved through a synthesis of existing data and information, collection of substantial new data on aquatic biota, hydrochemistry, hydromorphology and hydrology, and related modelling to address the specific objectives (outlined below). Produce for stakeholders a synthesis of current knowledge on the importance of the small stream network. Compile and analyse existing data on small streams in Ireland to inform the selection of study sites. Examine the effects of nutrient sources, processing, and export of nutrients in headwaters on nutrient status further downstream taking into account hydrological, hydromorphological and land-use factors. Build an integrated understanding of headwater stream hydromorphology across Ireland, emphasising physical and vegetation morphology, and dynamics within different landscape settings. Determine the contribution of small streams to catchment biodiversity and the role of hydromorphology and hydrochemistry in controlling their biodiversity potential. Model the level of intervention in the small stream network required to have a measurable effect throughout a catchment on both water quality (N, P & sediment) and flows, and overall delivery/maintenance of ecosystem services. Explore options for increased engagement of citizen science in monitoring the physical and ecological health of small streams. Make recommendations for the management of the small stream network. Here, the term small stream is taken to represent upland and lowland 1st and 2nd order streams (headwater streams), and short coastal streams. The focus of the work will be on headwaters streams. Eight work packages have been defined (see Fig. 2 ). The project will start with a synthesis of available information on the importance of small streams to initiate communication with stakeholders and introduce the project. This will be followed by a compilation and analysis of existing data on small streams in Ireland to inform the selection of sites for the proposed research. Three work packages will collect new data on hydrochemistry with a focus on the nutrient retention potential of headwater streams, hydromorphology and biodiversity. All three investigations will share common sites to enable interconnections between the three elements to be explored and provide an integrated approach to the research. Modelling based on the results from each of the aforementioned tasks will be used to estimate the level of intervention in the small stream network required to have measurable effects throughout a catchment on both water quality (N, P & sediment) and flows, and overall delivery/maintenance of ecosystem services. Schema illustrating the eight work packages in SSNet and their linkages. Note: stakeholder engagement occurs throughout the project particularly in relation to the recommendations relating to the management of the small stream network. the capacity of small streams to retain and recycle nutrients across a gradient in river types, land use and management, nutrient concentrations and hydromorphological conditions. These will be used to assess the impacts of anthropogenic pressures on the nutrient water quality of small streams, their capacity to retain and recycle nutrients, and the implications for downstream water quality. The work will employ a range of empirical methods (e.g., the Source Apportionment methodology ( Mockler et al. 2016 ), Load Apportionment Modelling (LAM - Bowes et al. 2008 ), two-component endmixing models (e.g., Jarvie et al. 2012 ), and stream reach mass-balance measurements (e.g. Jarvie et al. 2018a ), to explore the sources of nutrients and patterns in instream net retention and release of nutrients. These will firstly characterise the hydromorphology of headwater streams based on a sufficiently large representative sample of (50+) stream reaches. These extensive sites will be surveyed for morphology and vegetation structure, and include mapping of in-channel (pools, riffles, eroding banks etc.) and riparian (terraces, scrolls etc.) physical features, complemented by a more detailed survey of the sediments, geomorphic and vegetation features (i.e. physical habitat) of a central 100-200 m reach. To complement biological sampling being undertaken across a subset of these extensive sites, a physical habitat survey (MoRPh, Shuker et al. 2017 ) will be applied to the same 100-200 m reaches. The MoRPh survey records the abundance of sediments, morphological features, aquatic and riparian vegetation, tree-related features and human pressures and interventions within short ‘modules’ (river length equivalent to 2 channel widths), providing information at an appropriate scale for comparison with macroinvertebrate and macrophyte sampling. A MultiMoRPh survey (10 contiguous MoRPh modules) produces a detailed record of habitat along a 100 to 200 m reach, further capturing the assemblage of habitats available to mobile species such as fish and also any contemporary indications of channel dynamics (widening, narrowing, migrating). 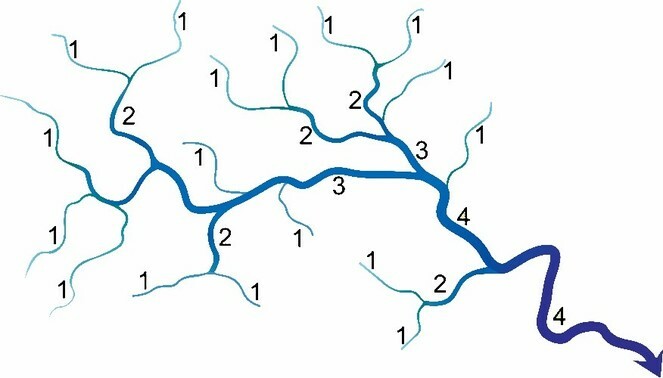 The data collected in these field surveys will be stored and mapped using a purpose-designed information system (www.modularriversurvey.org) that automatically generates a set of MoRPh and MultiMoRPh indicators. Available data sources, including information from maps, aerial photos and government statistics on land cover and management will establish the character and changes across the catchment over a minimum period of 50 (preferably 70) years. Available data sources will be mined to characterise the runoff regime and any likely changes over the same 50-70 year period. By combining these estimates with information from 1., broad changes in sediment delivery to the river network will be estimated. Information at the reach scale on current hydromorphological and vegetation characteristics, and human interventions within river reaches at the grouped sites and any changes noted from air photo and map sources (e.g. 1910 25-inch scale, 1980s/90s and contemporary 6-inch / 1:10000 scale) will support construction of temporal trajectories of change in reach properties. A time-space synthesis of the information from 1., 2. and 3. will reveal the degree to which the studied reaches are in an equilibrium state or are showing changes indicative of potential downstream effects on hydromorphology and habitat availability for the biota. The biological investigations will have four linked tasks each addressing elements of Objective 5. The core element on small stream biodiversity will involve the collection, identification and analyses of biological samples from a range of small stream sites. The focus will be on macroinvertebrates, macrophytes and phytobenthos. With the exception of the short coastal streams the role of headwaters in supporting fish populations is well known, particularly in relation to salmonids. Thus, work on fish will be confined to short coastal streams. We will also employ eDNA techniques in a sub-set of these sites to make comparisons with the results from the whole organism samples to evaluate the feasibility of using eDNA approaches into the future to compliment and in some cases replace traditional approaches to monitoring biodiversity and water quality in the extensive headwater network (e.g. Macher et al. 2018 , Pawlowski et al. 2018 ). A third task will be a focused study on salmonid populations in short coastal streams where considerable knowledge gaps exist on their contribution in particular to coastal sea trout fisheries. The final task will experimentally investigate the influence of hydrological regime change (in relation to land use and climate change) on small stream biodiversity and ecosystem function using the ExStream experimental mesocosm facility ( Davis et al. 2018 ). This is a powerful field research facility comprising 128 circular stream mesocosms offering the rare combination of strict control of experimental variables, excellent statistical power and a high degree of realism (see https://vimeo.com/243219546, Piggott et al. 2015a , Elbrecht and Leese 2016 ). Small streams are vulnerable to ecological impacts of the higher intensity of rainfall events and associated flooding predicted by climate change as evidenced in a small stream study by Feeley and Kelly-Quinn (2012) which may be more damaging than small increases in temperature, particularly in a multi-stressor environment ( Piggott et al. 2015b ). Modelling based on the results from each of the aforementioned research tasks will be used to estimate the level of intervention in the small stream network required to have measurable effects throughout a catchment on both water quality (N, P & sediment) and flows, and overall delivery/maintenance of ecosystem services. The CMT catchment modelling tool, first developed in the Pathways project ( Mockler et al. 2016 ) and subsequently being used in the ESManage project (www.uce.ie/esmanage), which can model a distributed network of sub-catchments, will be applied to the entire catchment including all of its sub-catchments. Then the effects on downstream water quality of interventions applied to each of the individual sub-catchments, one by one, in the order determined by their specific CSA ranking can be calculated and plotted as a function of the areas covered by the interventions. Bayesian Belief Network modelling, informed by information from the relevant domain experts and water users, e.g. fishermen, focused on specific services, will be applied to estimate the impact on those ecosystem services (e.g. Landuyt et al. 2012 , Marie Schmitt and Brugere 2013 , Hallouin et al. 2018 ). Citizen science is becoming increasingly involved in environmental research (e.g. Silvertown 2009 ) including on river environments (e.g. DiFiore and Fitch 2016 ) contributing to a ‘research revolution’ ( Roberts 2016 ). This is because the spatial and temporal cover of data collected by volunteers can greatly exceed that of other means of monitoring, although data quality depends upon using simple, clearly-defined methods to reduce operator variance to reasonable levels ( Bird et al. 2014 ). Within the last few years there have been growing efforts to raise awareness among the general public in Ireland and in particular to harness local communities about water quality issues. Momentum has increased with the establishment of the Local Authority Waters and Community Offices (LAWCO). We will engage volunteers in both biological water quality and hydromorphological assessments and evaluate the potential of citizen science in facilitating greater monitoring coverage of the small stream network. Overall, the proposed research will help harness scientifically robust knowledge to further an appreciation of the importance of the small stream networks and to integrate them into policy, management strategies and measures for sustainable resource use, as required by the WFD and the other legislative and policy targets. The research will inform recommendations for the management of the small stream network. This project (2017-W-LS-14) is being funded by the Environmental Protection Agency, Ireland. The role of headwater streams in downstream water quality. Citizen science – a research revolution?